Imagine if there were an elegant luxury sedan on the market that boasted both unbridled power and penny-pinching fuel efficiency. Well, stop imagining, and start test driving the newly revamped 2016 Toyota Avalon Hybrid. It combines all the splendor and elegance of the Avalon with the efficiency of a Prius, without sacrificing one iota of Avalon's formidable power. In other words, the Avalon Hybrid has everything you want in a roomy, limousine-like sedan, except for those frequent stops at the gas station. How can a fuel-efficient hybrid engine move a full-size car along the highway so smoothly? It took Toyota over 30 years of global day-and-night research to come with the answer. The Prius hit the market over 20 years ago, and most of them are still on the road today. We invite all our friends and neighbors to visit us. 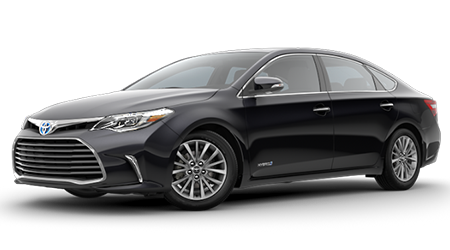 We serve Arlington, Mansfield, Grand Prairie, Fort Worth, and Irving so visit our modern showroom at 1661 Wet N' Wild Way in Arlington,TX, and see the 2016 Avalon Hybrid in its best light. The 2016 Avalon Hybrid will pamper you like a doting parent, showering you with regal opulence and unspeakable comfort. The moment you shut the sturdy doors, a feeling of peace and quiet overtakes you as special cabin insulation keeps the noise to a minimum. The new Avalon Hybrid is quieter than a closed library! Inside you will find an available three-zone climate system that gives you separate settings for the driver, front passenger and rear passengers and the epitome of personal coziness. You can upgrade to black perforated leather-trimmed front seats with both heat and ventilation controls, but even the standard bolstered seats and soft-touch upholstery are incredibly comfortable. An available 10-way power adjustable driver's seat puts you exactly where you want to be and riding high in the saddle. Remember when environmentalists and tree-huggers used to say, if you're not part of the solution, then you're part of the problem? It has never been truer than it is today. With gas stations destined to go the same route as pay telephone booths, the time to switch to hybrid power is now. The new Avalon Hybrid performs so much like its non-hybrid namesake that there are no more excuses. With Super Ultra Low Emission vehicle accreditation, and a life-affirming 40 mpg combined EPA rating, the 2016 Avalon Hybrid tells everyone you have arrived in a very responsible way. Critics are raving about the silky-smooth ride, thanks to the Avalon Hybrid's fully independent suspension and new stabilizer bar. This full-size luxury vehicle grips the road and handles turns like a high-performance coupe, all the while keeping you ensconced in luxurious amenities. You will feel like a race car driver when your fingers work the steering wheel-mounted paddle shifters. If you've never experienced paddle shifters before, a test drive of the 2016 Avalon Hybrid will thrill you to no end. Toyota has always been a leader in aerodynamic technology, and the 2016 Avalon Hybrid has special diffuser panels under the chassis to modulate turbulence. It is the perfect blend of vroooom and va-va-voom! If you are interested in a high-class hybrid that handles like a souped-up dream and thumbs its nose at gas stations, the Avalon Hybrid may be the game-changer that finally convinces you to go green. There is only one way to find out for sure. We proudly serve Arlington, Mansfield, Grand Prairie, Fort Worth, and Irving, TX so drop by Family Toyota of Arlington at 1661 Wet N' Wild Way, TX for an exhilarating test drive of the 2016 Toyota Avalon Hybrid but remember to bring your coolest sunglasses!